Tim Chester unpacks this gripping part of Israel's history, revealing the wonderful portrait of Jesus painted there. 1 Samuel is a book of barrenness and battles, kings and schemes, shepherds and giants. It recounts the history of Israel as it moved from no king, to the king it demanded, to the king God knew his people needed. But its greatest excitement lies not in the events and characters, but in the person they all point to. 1 Samuel presents us with a wonderful picture of Jesus. Seeing him in and through this Old Testament book enables us to see him with fresh colour and texture, and see afresh what it means for us to follow him today as our Ruler and Rescuer. 1 Samuel is a book about ancient times, that speaks directly into ours. • LEAD: As notes to aid you in explaining, illustrating and applying 1 Samuel as you preach or lead a Bible study. 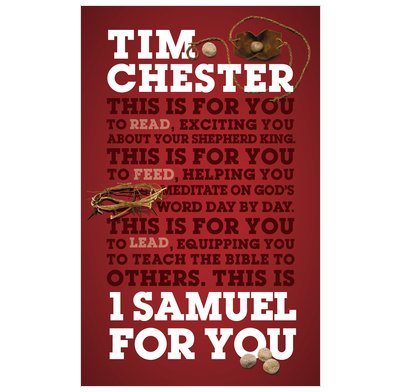 1 Samuel For You can be used alongside Choose your king, Tim Chester's Bible study resource for small groups and individuals. Tim Chester is Director of the Porterbrook Seminary and a pastor in the Crowded House church network in Sheffield, England. This is a remarkable read. I have read 1 Samuel in my own several times and did not think I was going to get a lot more out but man was I wrong!! Please read this book. It is a perfect devotion to show who God really is and what giants are in our lives. This slim volume takes you through 1 Samuel in sequence. It is not intended as a commentary but provides chatty and, at times, devotional comment on the biblical text. There are many wonderful insights, for example, the relationship between David and Jonathan is often portrayed as between two young warroirs - in fact, Jonathan is old enough to have been David's father, which puts a different complexion on their exchanges. The book complements the Good Book Guide to 1 Samuel by the same author, although the latter is a relatively brief look at 1 Samuel so misses out a lot of the content of I Samuel for you. 1 Samuel for you is actually a better companion for a sequential bible study of 1 Samuel as a lot of the devotional points made in the bible study guide are also made in the companion volume.